I have problem with my lights building. I've both static and stationary lights in the scene. All the stationary lights are baking fine, but static lights do not at all like they've never exist. I've read all threads about lighting issues and their solutions on Unreal's Answers but none of them helped yet. 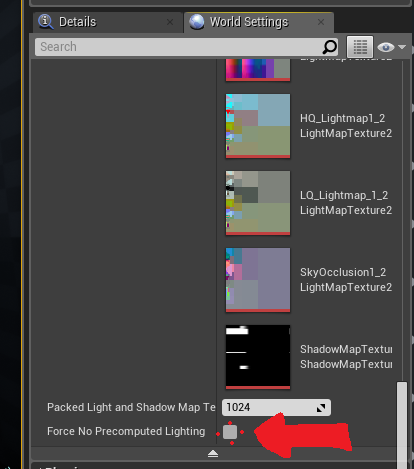 • All the lightmap stuff like resolutions, UV's etc are properly set. • Tried to bake static point lights on a new blank level with some BSPs and it WORKED. • The only warning I get after bake is: "SkySphereBlueprint Collision enabled but StaticMesh (SM_SkySphere) has no simple or complex collision." Would be super-grateful for any suggestions, Thank you. Do your Static Meshes have proper Lightmaps and the Resolution of them is high enough? Yes, of course, like I wrote above, it's all set properly. Next thing to check is that you aren't an idiot like me who disabled baked lighting ._. Do you have reflection capture sphere place in the scene? I am having the same issue. I've found that if I change the attenuation value, then set it back to what it was, the lights pop back on. It's super annoying to have to do this every time after you bake. If anyone has a better method, please let me know. click on one of the lightmaps and save it, then close that window and click the scene.